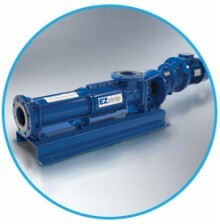 The EZstrip Transfer Pump is the latest revolutionary new pump design which can be 'Maintained-in-Place' (MIP), making a day-long maintenance operation become a 30 minute job. This innovative sewage pump is the biggest leap forward in progressing cavity (PC) pump design for 30 years and is an extension of Mono's popular Compact C transfer pump. The EZstrip has been specifically designed to provide a quick and easy way to disassemble, de-rag and maintain a PC pump in-situ, eliminating the costly maintenance and down time that servicing can often cause.